All the winter weddings are coming up and there are soo many brides running around in search of that perfect wedding outfit. But in all of that wedding madness, you may or may not remember that winter = cold and picking out that gorgeous, glittery, midriff-baring / backless outfit wouldn’t be the wisest idea. So how do you spruce up your wedding look to suit the weather and yet manage to look absolutely gorgeous, not to mention uber-trendy? Well, keep scrolling! These are some winter wedding outfit tips that you wouldn’t want to miss out on this wedding season. This one is kinda obvious. But what y’all forget is that long-sleeved blouses can look extremely stylish! Choose heavy fabrics like velvet along with embellishment. You could even try opting for a knit blouse, as seen below, for a laid-back yet chic winter wedding look. Pair it with a heavy neck-piece to keep up with the wedding-worthy glitz. This outfit is perfect for a winter wedding as it is as elegant as it is ideal for the cold. The length of the jacket adds a classy, dramatic touch to your ensemble. An elaborate or detailed border works well for this style. Who said gloves are only paired with western wear? These pictures will prove to you how chic a pair of the right kind of gloves would look along with your Indian winter outfit. Try out some embellishment or floral motifs or maybe even net, though it won’t do much for the cold. 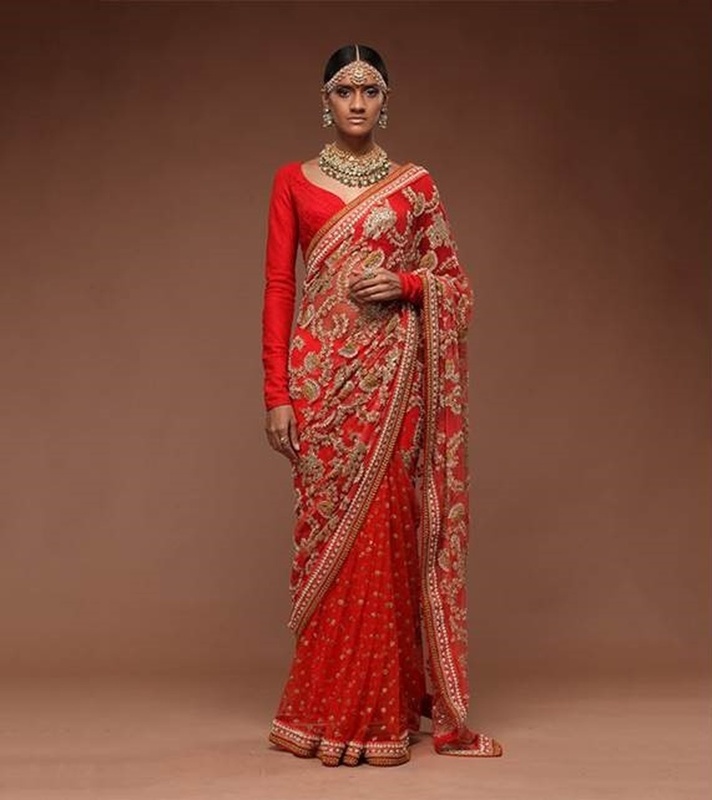 Okay, we know that Indian weddings avoid black, but hey, times are changing and if Sabyasachi says yes, who are we to doubt? Check out the images below for some of his black bridal lehengas and sarees that are just drop-dead gorgeous. Let’s take a look at Sabyasachi’s winter collection where he incorporated fur for some great outfits. Albeit, they may not be lehengas or sarees, taking inspiration from them and adding fur elements in your bridal wear could you really up the fashion factor at your Indian winter wedding too. Okay, this one is especially for all the quirky, off-beat brides out there. Who wants to wobble around in the cold wearing 6-inch heels when you can be super-comfortable and have warm feet in a pair of fabulous sneakers? Check out Monisha Jaisingh’s colourful take on it below!